Murphy Gubbins Auctioneers and Chartered Surveyors are proud to bring this well appointed and spacious home to the market. 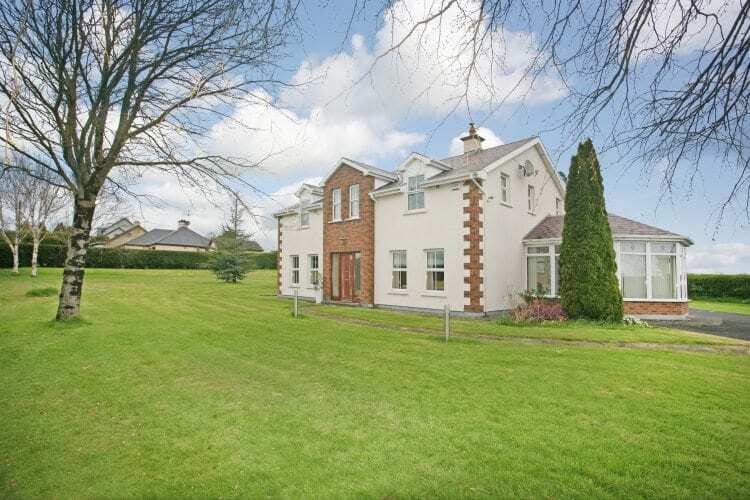 Located just off the main Patrickswell to Raheen Road this bright detached property enjoys country living with all the amenities of the city on its doorstep. Sitting on a c. 1 acre private site with manicured lawns it offers wonderful views of the surrounding countryside coupled with the cleverly proportioned living space this truly is an excellent family home. On entering the property, beyond the glass panelled front door, you are greeted with a bright hallway. To the right is the family room with a feature granite fireplace and wood burning stove, there are two windows overlooking the front garden, Towards the rear of the house is the Living Room, Kitchen, Utility with WC and Sunroom. The living room runs the length of the house with dual aspect windows ensuring this room remains light filled throughout the day, it has a feature granite fireplace and impressive parquet flooring and two sets of double doors leading to the garden/patio area. Across the hallway is the kitchen / breakfast room which is adjacent to a spacious sunroom and a separate utility with WC. The kitchen is a bright space owing to the two large velux windows in the ceiling, it boasts a wide range of modern units, including an integrated double oven, hob and stainless steal extractor fan. The utility room has ample built in storage with separate WC. The first floor boasts a large light filled landing, currently in use as an office with 4 generous double bedrooms. The master bedroom is located to the rear of the property enjoying views of the country side and an en suite which doubles up as a steam room. Bedroom 2 has a rear garden window aspect with wall to wall built in wardrobes and bedroom 3 and 4 are located at the front of the house. Externally the house has been well maintained, it has a tarmacadam driveway, two separate patio areas and a large detached garage. Additional modern features include a high spec security system and central vacuum system.